The Hylian Shield is the name of a recurring shield in the Legend of Zelda series. It is a metal heater shield, we have recreated this shield same as it has been used by Hylian Knights; somehow its design varies. 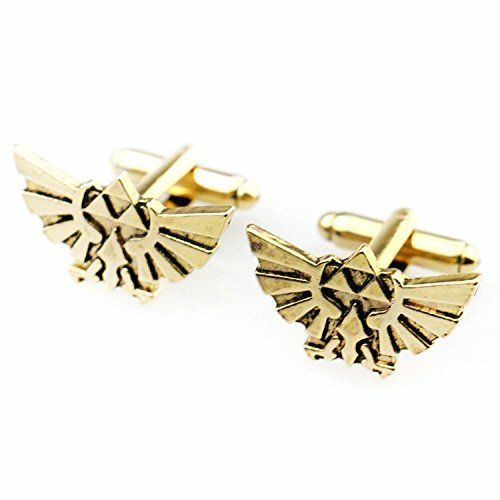 But this piece is very attractive, I am sure when you will wear this Legends Of zelda cufflinks everyone is going to admired, then what are waiting for go and grab this amazing item, you can wear this cufflinks in any cosplay party. This well-designed legends of zelda merchandise is made from finest material to have longer durability. ► The silver and enamel-plated cufflinks measure 1 cm by 2.5 cm each. ► Logo of shield is imposed on cufflinks. ► The legend of zelda merchandise are inspired by the Hylian Shield found in Zelda. ► Very easy to use, you just want to attach cufflink on your shirt sleeves. ► Arrives in our complimentary gift box. ► the legend zelda triforce merchandise would be best and Perfect Wedding Groomsmen Gift. ► Even you can wear this legend of zelda triforce jewelry in any cosplay party. ► This the legend of zelda Cosplay costume jewelry can attract many girls and you can be centered guy of the party. ► Very durable. You won't regret. ✔ The legend of zelda accessories is gorgeous presentation as a gift for your loved one, or for you.